CURV III is the fourth in a family of cable-controlled underwater recovery vehicle (CURV) developed and used by the U.S. Navy. 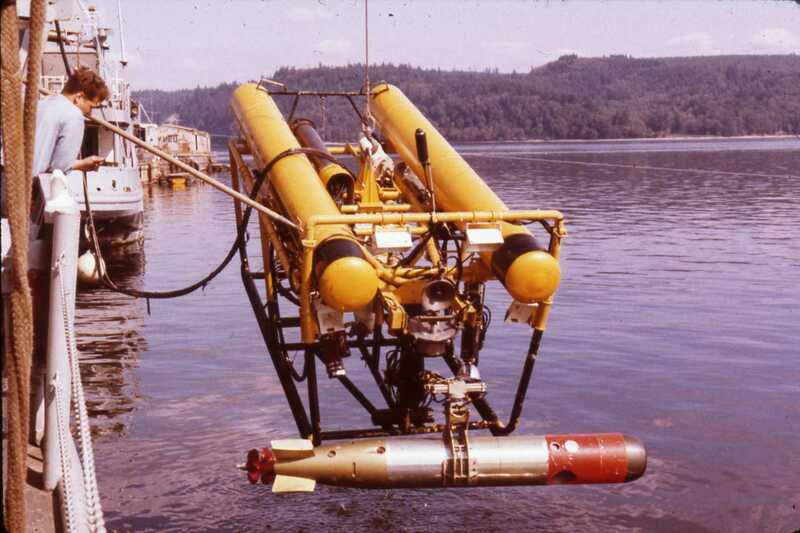 The Naval Undersea Research and Development Center (NUC) (today Space and Naval Warfare Systems Center Pacific) designed the first CURV — the first successful underwater remotely operated vehicle (ROV) — in the early 1960s to recover test torpedoes. The tethered vehicle completed several recoveries for NUC at its test ranges within its depth capability of 2,000 feet. Navy salvage personnel pose with the recovered H-bomb and CURV I, April 1966. 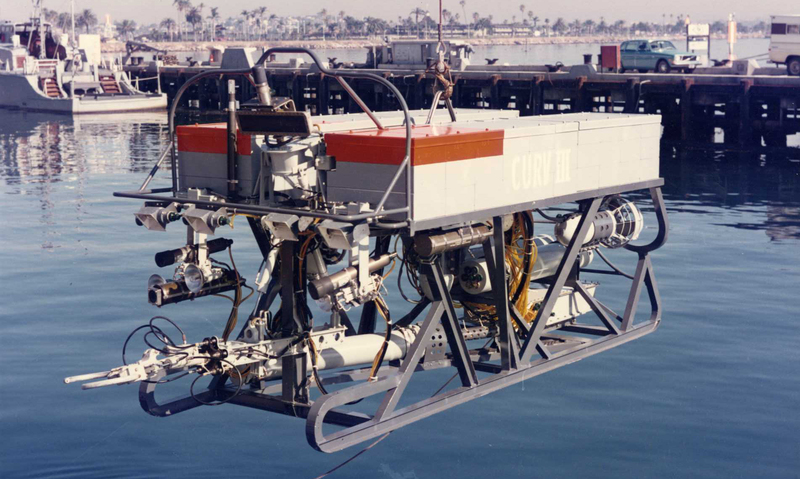 CURV I demonstrated the potential of ROVs in April 1966 when it retrieved a lost hydrogen bomb from the Mediterranean Sea. The bomb had fallen from a B-52 bomber that collided with a KC-135 tanker on January 17 near Palomares, Spain. Submersible Alvin (DSV-2) located the bomb but failed to recover it. CURV I was temporarily modified to function at greater depths and successfully lifted the sunken H-bomb from 2,850 feet. CURV II, built to perform torpedo retrieval operations, is lifted to the surface holding a recovered Mark 46 torpedo. After this impressive demonstration, NUC began developing a new CURV system with a deeper work capability. The project grew as NUC engineers realized the wear and tear on CURV I meant it would not last until the new deeper system was completed. CURV II was thus designed as a replacement for CURV I; it retained most of the same design features but incorporated some modifications for reliability, while also increasing operating depth to 2,500 feet. Scientists cannibalized portions of CURV I for the construction of CURV II and designed the new vehicle to use the same support ship and gear. Two CURV II vehicles were built: one for the Naval Ocean Systems Center in San Diego, California, and another by the Naval Undersea Warfare Center–Keyport (left) for use in recovering torpedoes at their testing ranges. CURV III was an entirely new system that utilized concepts from the development of CURV I, but was designed to work to 7,000 feet — an achievable intermediate step towards a long-term goal of 20,000 feet. For life-saving operations only, CURV III could descend up to 10,000 feet. CURV III entered a rigorous checkout testing phase after its development was completed in early 1969. Several failures occurred — most seriously the implosion of all 48 buoyancy units at 6,500 feet — which required its engineers to revisit its design. CURV III’s frame, buoyancy units, cable floats, and several connectors were redeveloped and the resulting vehicle became known as CURV IIIB. The modified CURV IIIB performed well, even retrieving a NASA instrument pod from the Atlantic Ocean in March 1970. But in October the ROV was unexpectedly lost when its cable was severed during a storm off Vancouver Island; it was never found despite extensive search efforts. Information gathered from an investigation into CURV IIIB’s loss was implemented into the design of the new CURV vehicle, CURV IIIC. The biggest change was the addition of rescue equipment that would activate in the event of a vehicle failure to facilitate its recovery. CURV IIIC’s design and manufacture was rapidly completed; six months after CURV IIIB disappeared, the newest CURV was in the water passing its checkout tests with flying colors. 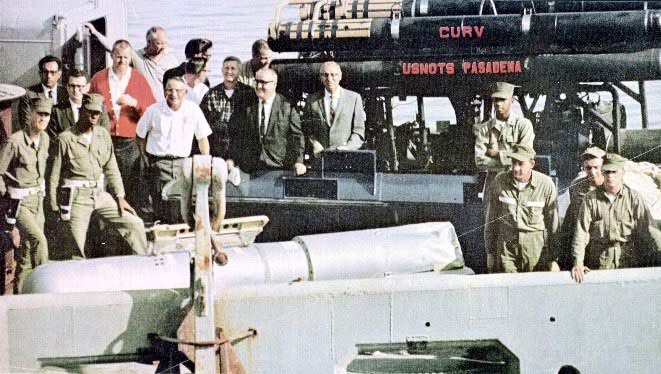 In addition to many routine torpedo retrievals, CURV IIIC performed some high-profile operations. In 1973, it performed the deepest underwater rescue in history after Canadian commercial submersible Pisces III sunk to the ocean floor at 1,575 feet with 76 hours of life support. CURV IIIC deployed 6,000 miles to the stranded submersible and facilitated the rescue of the two men inside with minutes of air remaining. After the freighter SS Edmund Fitzgerald tragically sank in November 1975 in a terrible storm on Lake Superior, the Navy used CURV IIIC to locate and film the wreckage. The findings allowed the Coast Guard to determine the cause of the sinking. The Navy developed CURV 21, currently in use, as a direct replacement for CURV IIIC. CURV 21 built on the design of CURV IIIC but includes newer technologies and functionality in a smaller footprint. It operates to a depth of 20,000 feet and can be integrated with side scan sonar system Orion into a single search and recovery system.